Join the NRA Here & Save $10!! "Don't Sit There Scared- Get Prepared!" **Our Goal Is To Empower Our Clients, Through Education and Training, To Gain the Personal Firearms Knowledge Required To Protect and Defend. Whew 2018 was a BLAST! As Chief RangeMaster at Central Carolina Gun Club Inc I will continue to serve our growing 600+ members & support the ranges growth & success. In 2019 We Are Focusing On Instructor Development & Long Range program development. Email Crystal for private instruction (Usually scheduled on Wed!). We are also proud to be assisting Durham Pistol Rifle Club continue the Women of Steel programs into 2019!! NEW RANGE ALERT! Join CCGCI NOW! 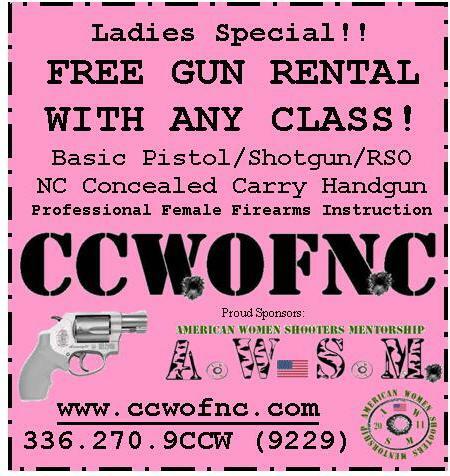 Register Online for Concealed Carry Class Here!! NEW! NC CCH Refresher! Sunday May 5th 12-5PM! We also develop & support Instructors so if you are compelled to share firearms safety, usage & enjoyment we will help you along that path. PLEASE BE SURE to indicate your preferred class date! Location of Class: Burlington NC Alamance County Zip: 27217 Classes are NOT necessarily held at CCGCI..the location will be provided at registration confirmation. We Are a Private Training Org dedicated to sharing the traditional values of the NRA incuding Knowledge, Skill & Attitude for all eligible, law abiding citizens. "You Might Pay More But You Won't Get More. Ask Around!" We Travel & Enjoy Going On The Road! 1. Your handgun & 30 rounds of ammunition. If you do not have a handgun you can use ours. Pre-registration & Pre-Payment Required. No Refunds. We try not to reschedule unless unavoidable. Fear of the Unknown is a Natural Inborn Survival Reaction. But when Knowledge replaces that Fear we achieve Confidence & Ability. Through Education, Training and Consistent Practice we will attain the necessary skills to Endure and Survive a Dangerous Situation. We Believe it's Better to be Proactive Rather Than Reactive. Q: I'm a NC resident. How do I obtain a Concealed Carry Handgun Permit? A: Concealed Carry Application Packets are obtained through your County Sheriff's office. You will want to stop by and pick up a Concealed Carry Applicant Packet, although we usually have copies if you can't make it by. You must successfully complete a Concealed Carry Class and submit your Certificate with the application. We will Notarize your application & affidavit FREE OF CHARGE. HOWEVER we have experienced some inconsistent procedures so you may want to call your local Sheriff's Department and see what their procedures currently are. We are glad to assist any way we can and encourage you to support & exercise YOUR 2nd Amendment Right! Just another way we are trying to support our 2A Rights!! Q: I took the class but never applied for the permit & can't find the certificate. What do I need to do? A: Depending on the length of time that's passed you may need to take the class again. If you took the class here originally there's no charge to repeat. Lost certificates cost $10 to replace. Check out CCWOFNC's Adventures in Firearms Recap!! NC Dept of Justice Dos & Don'ts Page...Scroll to page 42!! We Proudly Support the American Women Shooters Mentorship aka: A.W.S.M! NEW!! Refuse To Be A Victim Safety Seminar!